Tell us a little about yourself: what is your first name, how old are you, and what is your favorite ice cream flavor? Hi! I’m Hallie, and I’m 13 years old. I love chocolate ice cream (with hot fudge, chocolate chips, and chocolate sprinkles)! 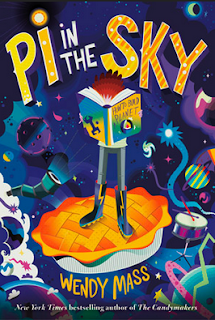 I read Pi in the Sky by Wendy Mass. She is one of my favorite authors, and the book looked really interesting. My favorite part was when Joss, the main character, created a sun to try to rebuild the solar system. The main character's problem is that his best friend has been transported through space and time and pulled out of existence, and an alien is the only one who can save him, and Earth. I would probably react the same way Joss did, by trying to recreate a solar system. I would be excited to be in Joss’ shoes! I would tell them about the plot and say it was a great book. I would say something like “Joss is the seventh son of the supreme overlord of the universe, and then Earth gets pulled out of existence, then an alien from Earth shows up, then they recreate the sun and then he pulls his friend out of a wormhole.” How could that not be interesting? I think the cover looks pretty cool, and it describes the book pretty well. I would definitely want to, maybe where Joss goes to Earth to see Anika. They were fun characters to read about, and it would be cool to see them again. They have unique personalities that are different from characters in other books, and that’s why this book is great. I can’t think of another book like it, it’s very unique. What was your inspiration for writing this book and this topic? Thank you to Wendy Mass for sharing your inspiration, and to Hallie for sharing your thoughts! Joss is the seventh son of the Supreme Overlord of the Universe. His older brothers help his dad rule the cosmos, but all Joss gets to do is deliver pies. That's right: pies. Of course, these pies actually hold the secrets of the universe between their buttery crusts, but they're still pies. Joss is happy to let his older brothers shine. He has plenty to keep his hands full: attempting to improve his bowling score; listening to his best friend, Kal, try (and fail) to play the drums; and exploring his ever-changing home, The Realms. But when Earth suddenly disappears, Joss is tasked with the seemingly impossible job of bringing it back. With the help of Annika, an outspoken girl from Earth, he embarks on the adventure of a lifetime...and learns that the universe is an even stranger place than he'd imagined. From the New York Times bestselling author of The Candymakers comes a world-hopping tale that leads the reader deep into the heart of the mysteries of time and space. Plus, there's pie. Hallie has convinced me for sure. Pi in the Sky is added to my to-be-read list. Thank you!